Forest City Fashionista: Good Day, Sunshine! 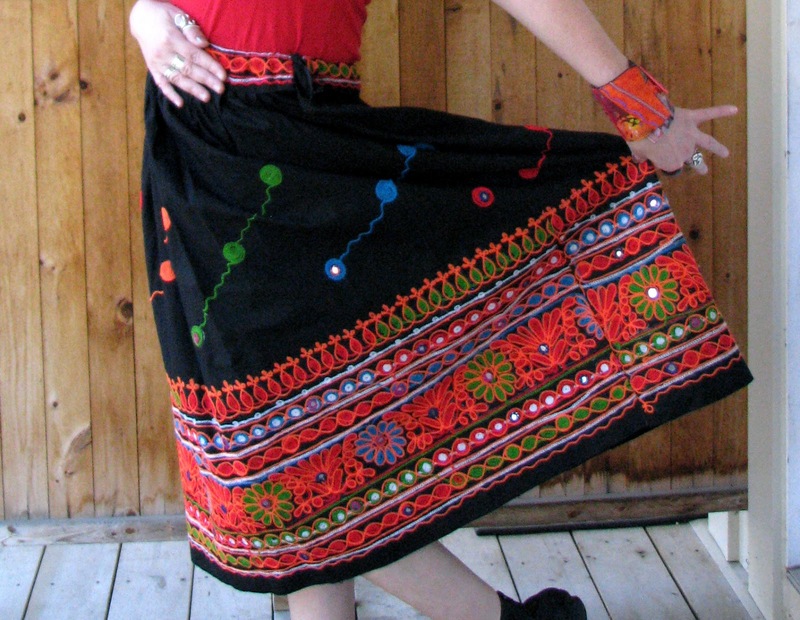 I had thrifted this skirt a few weeks ago, and remembered having one similar to it back in the 80's, with the embroidery and bits of mirror. This one is much nicer - I am in love with the colours! A woman working in one of the shops in my neighbourhood complimented me on the skirt and then told me how much she enjoys seeing what I'm wearing whenever I come into the store, which I thought was so nice! 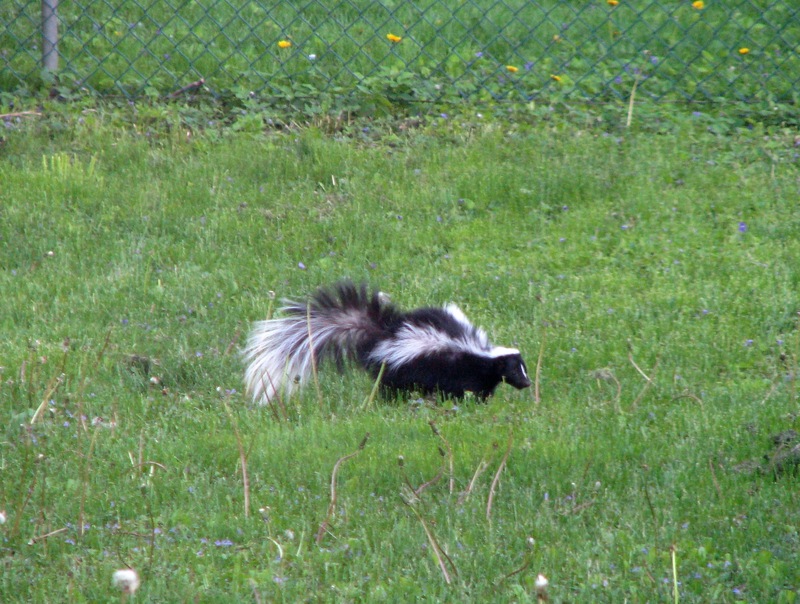 There was a skunk in my backyard - I thought those little critters were nocturnal, but apparently even they like some sun now and then. I took a walk around the neighbourhood, and found this - a "Little Free Library" on a post outside someone's house. What a great idea! 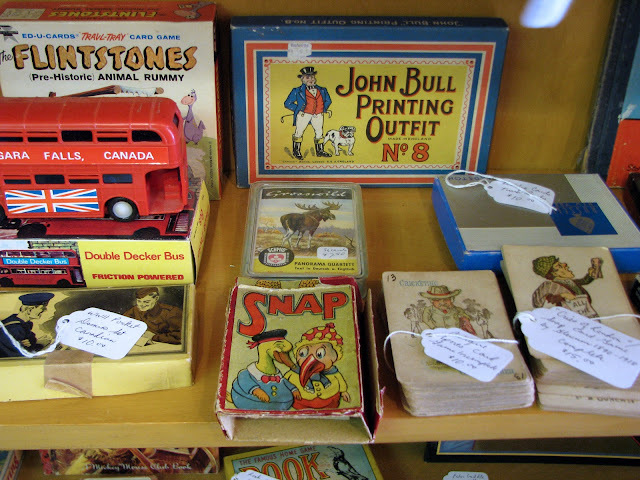 A new vintage store is supposed to be opening soon in my neighbourhood, and the owner has been taunting me for weeks with the various window displays of cool stuff. I like the orange-y dress with the collar and tie belt. Too bad I don't know any men that would wear the matching shirt. I poked around in a few of the other secondhand stores in my neighbourhood that are usually closed by the time I get off work and came home with a few treasures that I'll show you later. I also picked up a few props to use in a photo shoot I'm doing tomorrow for a certain blogger's magazine project. I took the opportunity to visit one of the newest additions to our downtown. 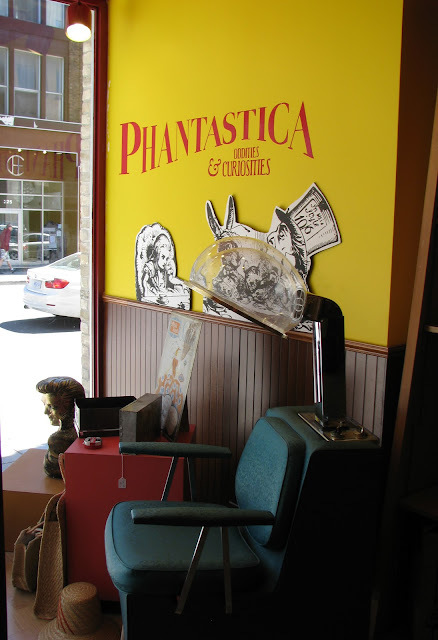 Phantastica, which features "Oddities and Curiousities" is a side project of the owner of Attic Books and is located on Dundas Street between Clarence and Wellington. 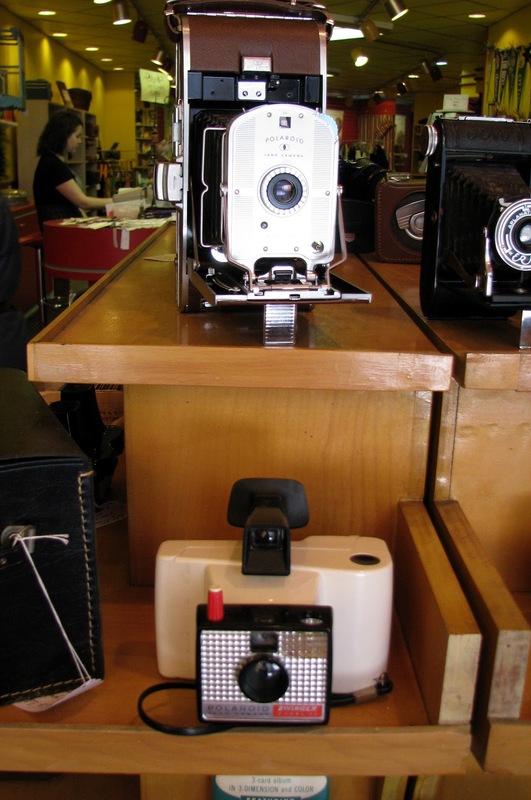 It's neatly organized and filled with items such as old cameras, kitchenware, sports pennants, medical paraphernalia, and other collectables. 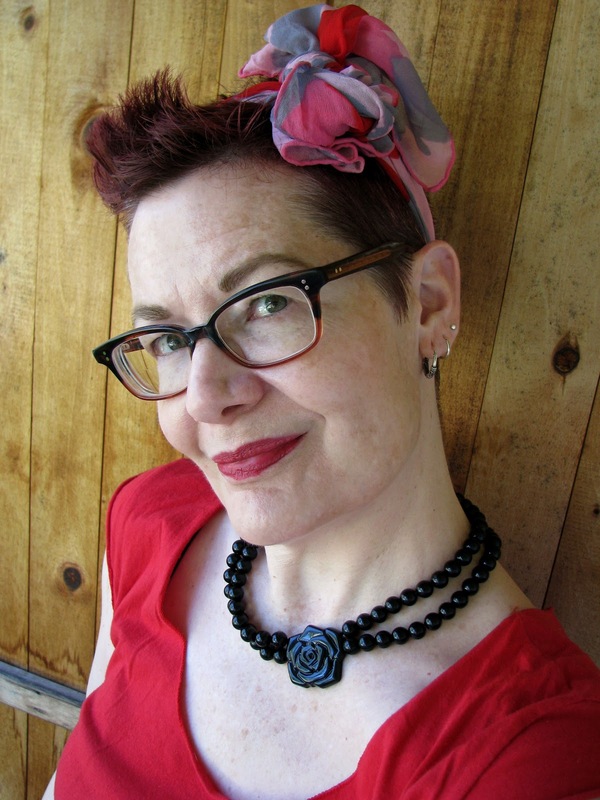 There is an excellent section of books relating to pinups, tattoos, burlesque, and other erotica, and some vintage accessories such as ties, gloves, sunglasses and hats. 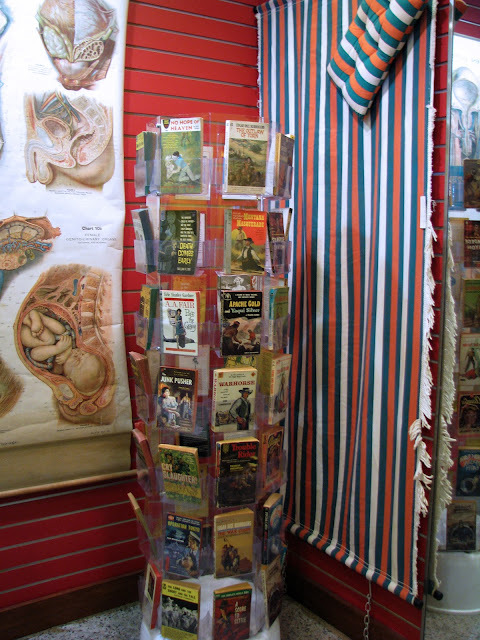 You've got to love a store in which you can buy a striped hammock, a cheesy pulp paperback, or a roll-up anatomical chart. I went home with some Betty Page comic books and cool postcards that feature covers of racy pulp novels. I look so happy and relaxed....funny what a day away from work and some nice weather will do for you! Sounds like a wonderful day! I just love that little library - the door, the doorknob, the color. What a fabulous idea! Wonderful photo-story! I love the library too, we should do that! And I recognize Bella's rose necklace - you look fabulous. You obviously made the most of your day off in the sunshine, Shelley! The outfit is fabulous, I adore that skirt, the bright red and the embroidery are stunning. 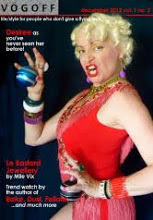 And you look a little cheeky - being off work has brought out your inner minx! 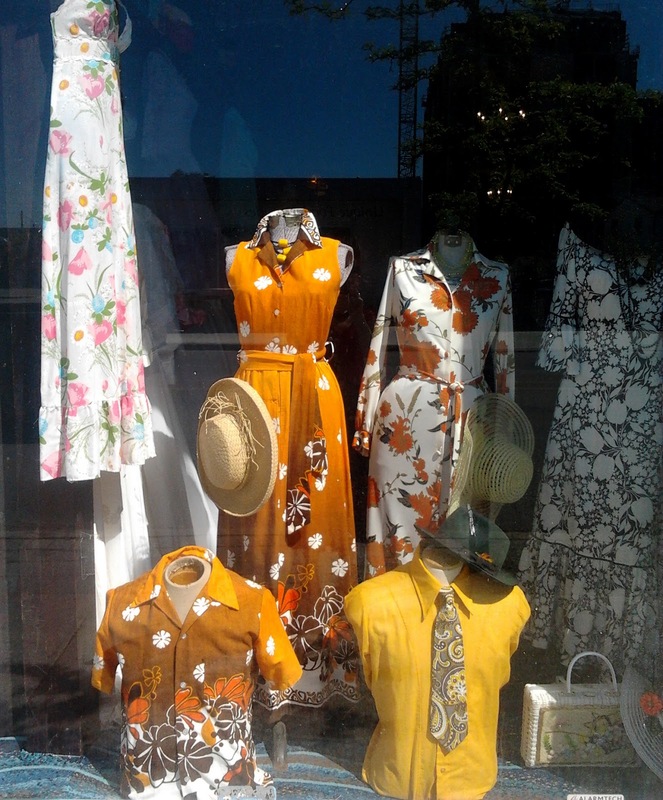 The vintage shop looks great, I am very taken with that orange print dress too, also the floppy straw hat and the wicker bag. That's a great outfit, right there! And the little library is adorable. 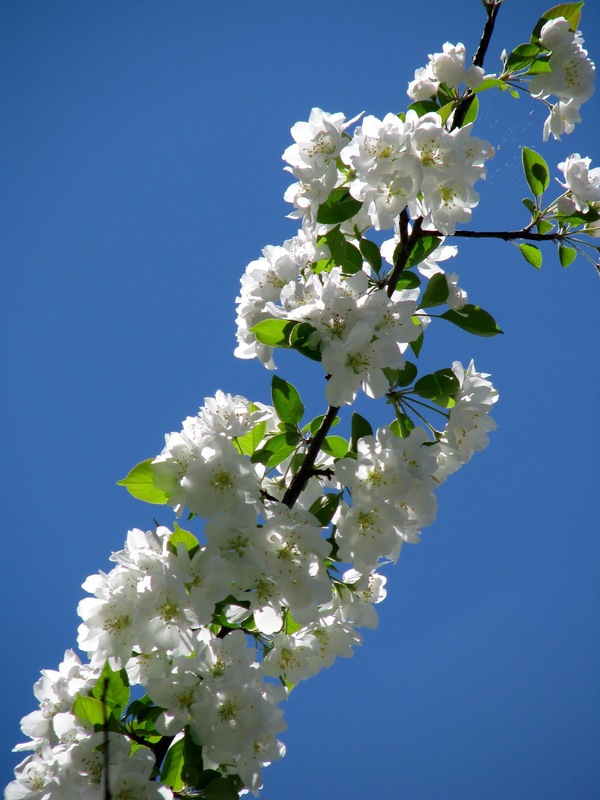 You do have a blissful look about you! That skirt reminds me of Frida and I love the fiery colors! It looks sweet on you! The vintage shop sure has a purty window, it will be cool to see what their stock is like. Enjoy the sunshine sweetie! Isn't nice to have those kind of days! You look splendid my dear! I love the scarf in your hair. 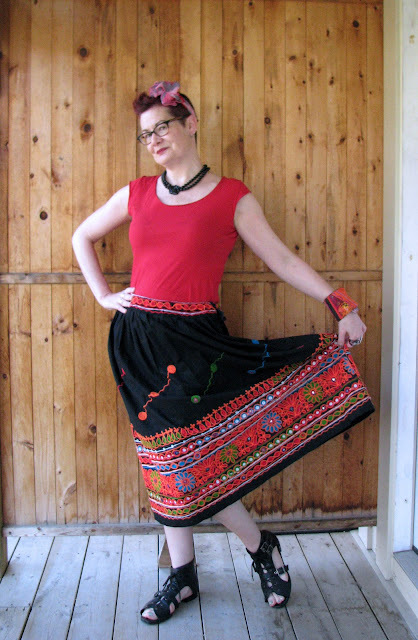 glad you've enjoyed a sunny day looking fabulous!, that skirt is really pretty, love all that embroidered hem and colorful details!, and it's so funny when you can run errands on a working day, everything seems so different! love that skirt. That free library is a cool idea! What great pictures! I love your outfit. Cool that a skunk was in your backyard! And the free library is really sweet!! Glad you got some time off! Sheesh, I love those reds. I have some pants with mirrors in them too. Don't you love that skirt? The library idea is very cool - I wonder how long a concept like that would survive here? Props? Did you say props? Oh, goody!!! And sunshine?! Can't wait! Loved following you on your day off. Of course you were complimented on that wonderful showstopper of a skirt. Looks like spring to me in your neighborhood and the scarf is definitely getting a new and exciting life. What a fantastic skirt! And that necklace looks good on you! There are a bunch of those little libraries in my neighborhood, it puts a smile on my face everytime I see one. I want to build one (ok have the bfriend build it for me) outside our little casa too! Thank you for taking me along your day off- it looks like it was a glorious day! The skirt is coming to me, then on to The Fashionable Bureaucrat and Curtise is on the list after that. 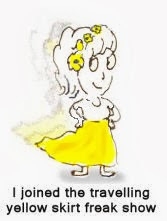 It's well-travelled and very popular, but don't give up, it may take a while but you'll get in on the fun. Have I told you how much I love your glasses? Thanks for taking me vicariously shopping with you - I love those kinds of posts! what a cool neighborhood you live in!! EEk, that skirt!!! I am playing catch up! your looks are so inspiring! You are the queen of the skirt, my dear! Oooh, I love your skirt. And I love how you've styled it. Do you have any tips for getting that scarf to stay put? I have been attempting to use scarves in my hair, but they do want to slip out. 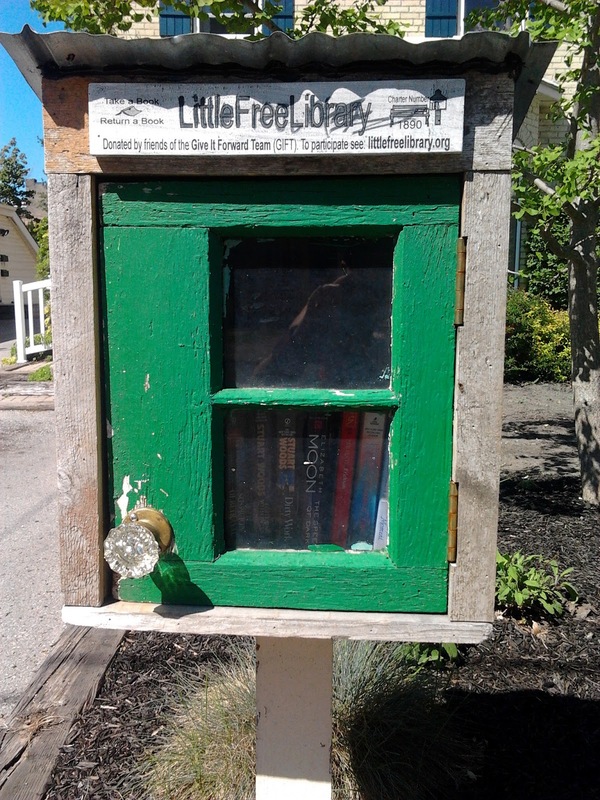 The little library is one of the coolest neighbourly things I've seen. The scarves I use are either silk or polyester and pretty slippery but I usually just tie it pretty tightly around my head in a bow. I don't have much hair so I'm surprised they stay as well as they do. 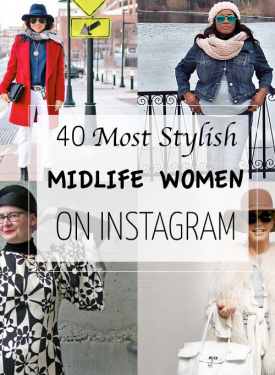 You have long hair, so perhaps a hidden bobby pin tucked out of sight to hold the scarf? Yay! Yay for days off work, for pretty embroidered skirts, for neighbourhood vintage stores, for photo projects and little libraries! I want to be your neighbour!